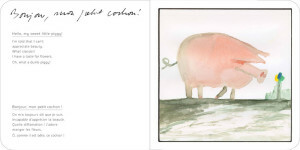 Unique children’s book by Borowczyk is published for the first time. Dumb Animals (Les bêtes sont-elles bêtes ?) is the first and last book for children by the painter, sculptor and filmmaker Walerian Borowczyk (1923 – 2006). Published for the first time, this bilingual edition is strictly limited to 2000 copies. 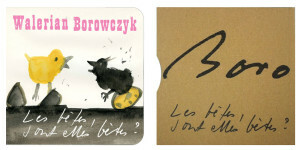 Featuring ten of Borowczyk’s original water colours, accompanying stories by the author in both French and English, and his original handwritten calligraphy. Dumb Animals is of interest to aficionados of cinema, enthusiasts of illustration and design, and, above all else, discerning children. Hardbound and complete with slipcase, ‘Dumb Animals’ is designed by Maciej Buszewicz, one of Poland’s leading graphic designers. Dumb Animals is published on April 1, by Le Chineur Editions (Paris).